Hurling is a religion in these parts. 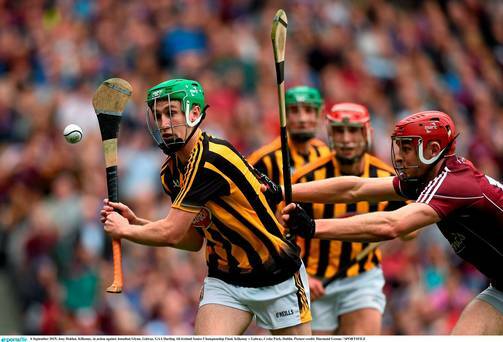 The Kilkenny team is the Yankees of the sport having won 36 championships (of 129 played – they’ve also been runners up 26 times). Next closest is Cork with 30 championships and 19 as runners up. We’re in season and the team’s colours fly everywhere in Kilkenny. I don’t understand the game but am charmed by the continuing health of a very-definitely provincial sport with no aspirations of, you know, going global. Hurling is Irish. I looked at a bunch of photos which all depicted some level of inexplicable sporting madness. It’s nice tagging along with Cornelia – it gives us time to just hang-out and chat in the car as she drives between the various puzzle pieces of her life. In 1988 she was travelling with her friend Nicola and I was travelling with my friend Jerry Lee (whom I visited in Florence a few weeks ago). We were all heading to Greece when we met at the train station in Bari, Italy. We fell in together and spent a few weeks in company. 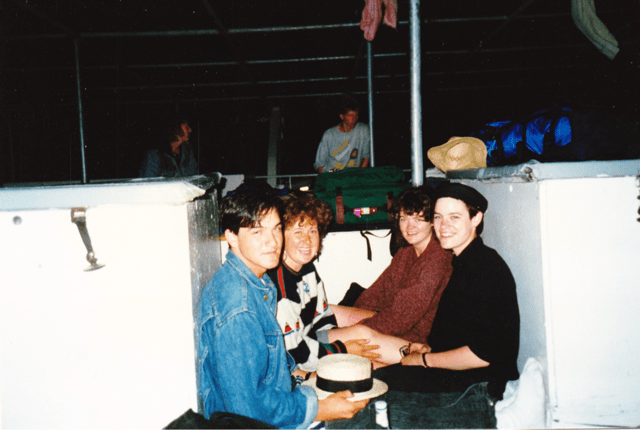 Jerry Lee, Cornelia, Nicola, and me on the ferry from … Athens to Santorini maybe? We’ve kept in touch off and on over the years but I last saw her in 1995 when I was in Ireland with President Clinton. I’m missing being on the bike but know I need some rest and I am not missing the ‘travel’ per se – the packing and unpacking, the finding a place to sleep, etc. Also, my lack of interest in Kilkenny is a real sign of needing a break. How important is getting to the Vuelta? Anyway … I’m still not sure – but I’d like to settle some plans for the next couple of weeks – set some accommodation, book transport. Dunno, dunno. I just need to get through the stuff that needs doing, spend a few quiet days moving in an orderly way through stuff would be good. And look for the energy and spirit of it to come back into it. Yeah, a few quiet days, that’s what I need.